Every June, toward the end of the school year, a ritual takes place in France that speaks volumes about a nation that is both passionately proud of its education system and, at the same time, deeply worried about why it has gone so awry. It is the publication, in most national newspapers and on dozens of websites, of the questions posed in the philosophy paper that, by tradition, kicks off the baccalauréat school-leaving exams. In most countries, philosophy isn't a subject taught in secondary school at all, and even where it is, it tends to be taught as a history of thought, rather than as a discipline to be practiced and perfected. But in France, the land of Pascal, Voltaire and Descartes, philosophy is an integral part of the national school curriculum, and a compulsory subject for the 650,000 students ages 17 and 18 who every year sit the bac. The paper they must take is no SAT-like multiple-choice exercise: the students are required to write well-structured, clearly argued essays that refer to the ideas of past thinkers to bolster their own case. This year's questions included, "Is it the role of historians to judge?" "Should one forget the past in order to construct a future?" and "Can art dispense with rules?" At a time when nations including the U.S. and Britain have made a priority of fixing their school systems, this French way of doing things could, in an ideal world, be a model. 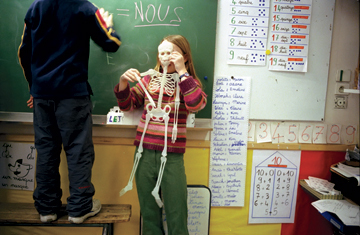 Anchored at the heart of French education are two notions that have become the mainstay demands of reformers elsewhere: the importance of setting high educational standards through a national curriculum and the enforcement of those standards through rigorous testing. Indeed, as part of his Race to the Top campaign to fix failing schools, U.S. Education Secretary Arne Duncan has already persuaded more than two dozen U.S. states to back a national curriculum for subjects including English and math. But if France, with its high national standards, is a model at all, it turns out to be a severely dysfunctional one  and nobody is more worried about that than the French themselves, who until recently used to boast about having the best educational system in the world. One of France's great strengths is that, unlike the U.S. or Britain, the best schools are public rather than private. That has spawned a tradition of meritocracy under which, in theory, any child from any background, rich or poor, can propel themselves into the elite of society by sheer intellectual prowess. But while they have been good at producing a relatively small number of extremely bright students who go on to run the country  a vestige of the system's elitism that dates back to Napoleon  French schools are increasingly failing to cater to the much larger number of students who have less stellar abilities. A big surge over the past two decades in the number of adolescents staying on until the end of secondary school has made those failings increasingly apparent, as a slew of official reports has recently highlighted. Among the findings: one-fifth of 11-year-olds finishing primary school still have serious difficulty with reading and writing. By the age of 16, almost as many  about 18%  leave school with no formal qualifications whatsoever. In international comparative tests of 15-year-olds, France's overall scores are at best mediocre and have been dropping abruptly in the past decade. Even at the top end, the proportion of brightest kids is lower than it is in many other countries, especially Finland. Most shocking of all, for a nation reared on the concept of égalité, is that school in France isn't the great leveler it was supposed to be, but actually perpetuates social differences. Increasingly it is a place where children from poor backgrounds do far worse than kids from better-off backgrounds. An analysis by McKinsey & Co. shows that the performance of French schoolkids can vary widely depending on their socioeconomic background: especially in math, race and class affect scores even more markedly than they do in the U.S., where the gulf between white, black and Hispanic students has been widely documented. In a scathing report earlier this year, the Cour des Comptes, the French equivalent of the U.S. Government Accountability Office, noted that the annual budget for education makes it the single largest area of government spending, ahead even of defense. Yet, said the report, the system is failing many of the 10 million children in its care: "The large number of young people with major problems at school shows that the educational system as it's constituted today isn't capable of responding to their needs." Even that much-vaunted philosophy paper has its dark side. An official analysis of the results over the past few years shows that it's the exam for which French students get by far the worst marks, with the average being a failing grade. That in turn has led to a backlash. Student magazine L'Etudiant this summer published a revealing test: it asked 10 philosophy professors to mark the same essay. The wide range of marks that came back, from convincing pass to dismal failure, sparked a storm of controversy, prompting L'Etudiant to call the exam a "lottery," a description quickly picked up by national media. See 10 things to do in Paris.